Powers is a Community with about 35,000 residents in the eastern part Colorado Springs, CO. The Powers Area was first developed in the 2000's and continues to see new real estate development today. Homes in this area can go as low as $122K to $500K in the exclusive Indigo Ranch developed area of Powers with a median priced home of $208,700. The typically Middle Class Residents of the Powers area enjoy easy access to Powers boulevard for which the neighborhood is named. Powers features an overwhleming amount of shopping, restaurants, and sporting events, with the Sky Sox Stadium being a favorite place to enjoy Colorado Springs weather and Triple AAA professional baseball. Cinemark IMAX Theater Cineplex in the Powers area is the best place in town to catch a movie, find some great food, and let the kids have fun in the water fountain. Powers residents are closely located to Peterson Air Force Base and will have a short commute to Fort Carson Army Base as well. 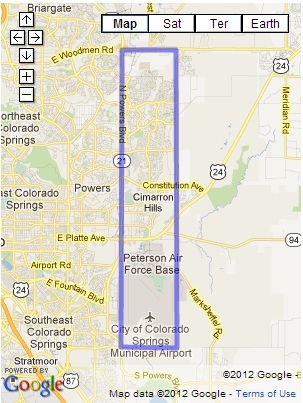 People who trael often will enjoy the easy access to the Colorado Springs airport from the Powers Corridor. If you looking for a newer home with a great bang for your buck the Powers area may be a perfect area to locate your new home. Search the #1 site for Powers Real Estate listings.